I hope that everyone had a beautiful Thanksgiving. Many of our holiday favorites were enjoyed over the course of the weekend. It was a bit of a drawn out affair around here, as we didn't get to roasting the turkey until Friday! Even though Graham and Margaret were still too young to enjoy a traditional Thanksgiving meal, I loved filing the house with that wonderful smell of roasting, baking and simmering. The house always feels coziest when there's a wonderful meal being prepared. We picked the last few bunches of herbs from the garden before the snow blankets the ground for the winter. I couldn't resist adorning a few pieces of brown transfer ware with them before they went into our Thanksgiving feast. Rosemary is one of my favorite herbs. We used it in everything from the turkey brine, to the stuffing. The sage accompanied the roasted brussel sprouts. Beautiful, as always Trina! I was so happy to see your spread in Country Living! It was gorgeous!! What a pretty, and fragrant touch. Splendid! We love the festive setting! Your transferware is beautiful! Congratulations on being in and on the cover of Country Living magazine ! I so enjoyed seeing you there ! Glad you had a beautiful holiday weekend! i love the brown and white pottery! The brown transfer ware is perfect for your autumn season! LOVE brown transferware! And yes, rosemary is superb in virtually everything...we use is on our lamb roasts. You are just the best . . . love, love, love " your touches " . . . 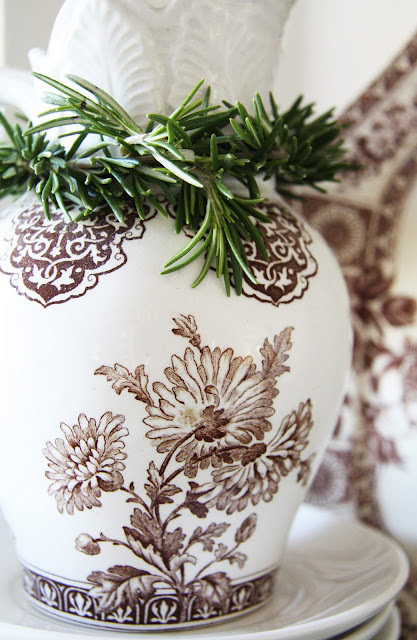 The green of the herbs against the brown and white transferware is stunning and so beautiful. Fresh grown herbs are the best! I love to use them for decorating as well as culinary. I just love Thanksgiving, and the aromas that go along with it. I love what you did, and how lovely everything looked. Great pictures. This past weekend I ran out to buy the Country Living that your beautiful home was featured in! Loved it! I love rosemary too, I often just pick a sprig to smell the lovely scent. All so Tastefully done, Oh I love this blog :D Kristín K.
Beautiful photos, Trina. We passed your Country Living magazine all around on Thanksgiving and everyone enjoyed it. I just received my Country Living magazine in the mail on Saturday. The photos and story of you and your sweet family were lovely and the magazine will remain in my collection for years to come! What a wonderful keepsake for your children also. 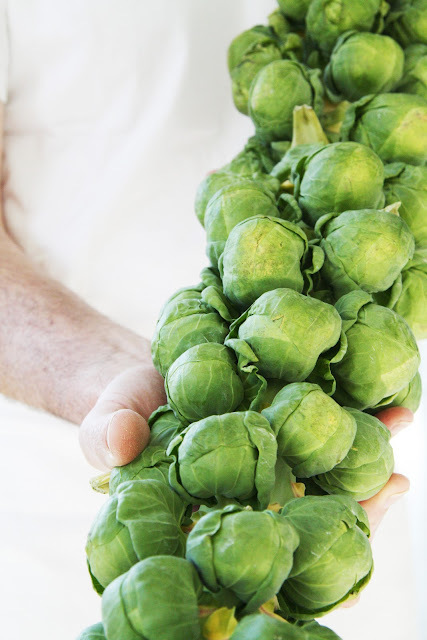 I love brussels sprouts and am probably the only person I know that does. Adore your posts - who knew that sage & rosemary garlands could look so enchanting! 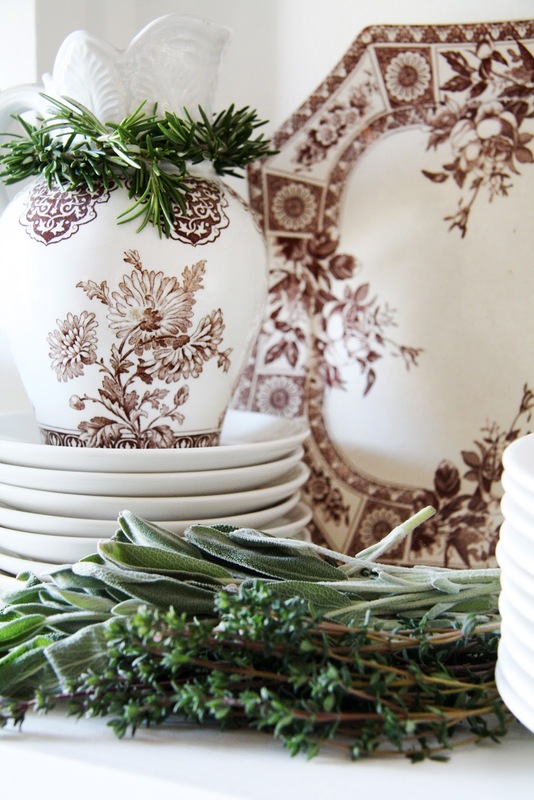 Brown and white transfer ware is one of my favorite things. I love using the brown and White for Thanksgiving. The green and brown look great together. Trina, just found your blog. Amazing! 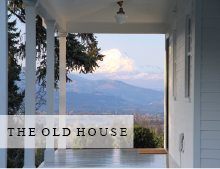 We renovated a 100 year old house so I know the pleasure (and pain!!). had brussels sprouts at thanksgiving for first time. Yummy, may be a new tradition. Newest follower. As always - a beautiful post. Your transferware is such a lovely pattern. I like a lot of open (white) in my transferware and this is just gorgeous. Seems as you had a nice Thanksgiving. I got real hungry when you mentioned the smell of the roasting, lol. Lovely, as always. The herbs just pop against the brown transferware of which I've just started a collection and used on our Thanksgiving back in October. What a beautiful idea. As rosemary grows year 'round in southern California I will have to remember this. I love your brown and white transferware. Your brown transfer ware is so pretty. When seeing yours, I always want to start a collection! My Christmas CL finally arrived! Your part in it is so wonderful. Congratulations to all of you! I agree, nothing makes a home feel homier than a great meal being prepared and cooked! Love your brown transfer ware, I've been seeing them everywhere lately. I just got my copy of CL today and what a treat to read all about you and your lovely home and family. Blogging is a funny thing...I wanted to tell my family "I know her!" Congratulations on a beautiful feature story in such a major magazine. What a big blessing! I have just gone back a ways through your beautiful blog and am so glad to have found it! It shows a life that looks so perfect....I know life is full of imperfections, but you are certainly blessed with a beautiful family and a beautiful environment. I will be looking forward to seeing you make it even more so! Your photos are beautiful! I love how clean and simple your blog is. I'm still looking over your blog and love what I see so far! Glad you had a nice and stretched out holiday with your two precious little butterballs! Simply Beautiful Post. I love the brown transfer ware. TRINA, I'LL BET YOU HAVE A YUMMMY BRUSSELS SPOUT RECIPE. Just beautiful! I have not yet looked at my CL magazine but will pay particular attention to the article about you. Is there any way to find out the manufacturer and/or pattern name of that brown transferware pitcher with the mums? If you have a moment to check, thanks. Beautiful china...so pretty with the greenery.